While the rest of the world has had the latest Honda CR-V for at least a year now, sales of the SUV have only just started in Europe. Honda is working quick to appease buyers in the Continent, however, as it is introducing a hybrid version currently only offered in China (and soon in Japan as well). Replacing the outgoing 2.2 litre i-DTEC diesel variant, the CR-V Hybrid uses the same Sport Hybrid Intelligent Multi-Mode Drive (i-MMD) powertrain as the Accord Hybrid. The whole setup consists of a 2.0 litre Atkinson-cycle i-VTEC petrol engine, a pair of electric motors and a lithium-ion battery to deliver a total system output of 184 PS and 315 Nm of torque. Notably, the system does away with a transmission entirely, instead using the engine to drive an electric motor/generator in Hybrid Drive mode; this powers the drive motor, which in turn drives the wheels. In Engine Drive mode, a lock-up clutch connects the engine to a single-ratio gearbox to drive the wheels directly, improving efficiency at highway speeds. This car also features an EV mode that draws power from the battery for petrol-free propulsion. Honda says that its i-MMD system is more refined than the planetary gearset used in other hybrids like the Toyota Prius (a system Toyota calls an electronic continuously variable transmission, or eCVT), and that its engineers worked hard to ensure a seamless transition between the modes. Aside from that, the Hybrid model is pretty much identical to any other CR-V sold in Europe, save for a Vehicle Driver Information Interface (DII) display that shows the workings of the i-MMD system. This means that it should be available with seven seats and the full Honda Sensing active safety suite as standard. 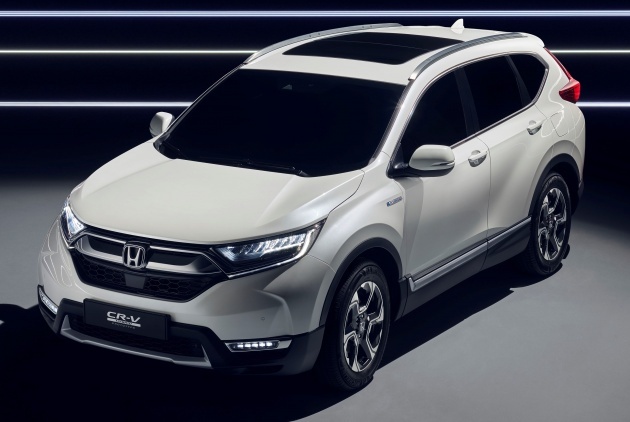 Production of the CR-V Hybrid for European markets will kick off next month – as will the order books for the car – with first deliveries slated to begin early next year. Hmmmm, not very objectively written. You must be Anti-Honda. Proton Design and Qualiy ? Choosing Kia instead of Hyundai ? Mercedes and BMW is difference category. Why not include Bentley as well or Range Rover ? Personally I think Audi design is the best, but that’s my personal opinion, and that’s knowing that Audi after sales in Malaysia in still very substandard. Lets write objectively and with facts for all to observe and be fair to all brands, each have their pro’s and con’s. Enjoy your day ahead. True. Moreover, as I look at current Honda models including CR-V, it feels me very boring. Upcoming Honda Accord, Upcoming Honda Insight and Upcoming Honda Clarity have same design. Honda is too overrated. Enough said. Lolz! Now got Honda bashers here as well. At least this Jepunis lord is better by starting to gip safety specs on par with JDM cars. Unlike stingy Toyota lord still none of their cars have active safety systems or direct injection engines. Really treat ASEAN lives like peanuts, but we all pay so exp for their outdated unsafe junks. Real topkek lord. Problem with Mazda is its not priced well. So all 4 Jepunis lords got problems one way or another. But at least Honda & Mazda do advocate safety, and Nissan slightly behind them. Toyota lord just dun care and still sell unsafe cars. John, do you know that Honda is actually hating Proton, Geely, Toyota, Mazda and others because Honda Malaysia is very greedy and very selfish which they don’t show any respect to Proton, Toyota, Mazda, Hyundai, Kia and continental carmakers and Volvo at all. As well as Honda Malaysia is very greedy and very selfish company doesn’t want to let Proton, Toyota, Mazda to be at the top 3 carmakers. You must understand John, why I already sell my Civic because Honda Service Quality is very terrible as well as Honda Assembly Quality is very terrible too but how can it be when Honda Malaysia Sales is at top no.2 carmaker. This shows that Malaysians including me is always being cheated by Honda Malaysia. Acutally, Honda Malaysia are keeping in silence and never tell their truth at all. Greedy is no problem, thats just doing business. But dun lor like toyota sell unsafe outdated junks to customers hoping only the badge in front is all that matters. Dun endanger customers and dun cheat them out of the specs like in their JDM cars lor. Deswai I alwiz advocate brands that prioritise safety to customers. But actually at least Toyota Malaysia, Mazda Malaysia, Nissan Malaysia are improving their quality. Unlike Honda Malaysia, the condition still the same and Honda Malaysia will never ever improve at all. Honda must also dim down its CRV headlights, too glaring to oncoming traffic! why does the accord which shares the same powertrain but have 15 bhp more than this crv ? The outgoing engine is a 1.6 160 hp, the 2.2 has been out for over three years now!